Erick Erickson has been an avid Movie fan all his life. At 9 years old Erick was accepted to the gifted youth program at the prestigious Chicago Art Institute. He continued classes for 8 years. Attending College at the Kansas City Art institute and School of Design he majored in Industrial Design and graduated at the top of his class on the Deans list in 1974. Erick started designing Cracker Jack toys and Cereal premiums. and went on to design Toys Manufactured by Mattel, Parker Brothers, Kenner, Milton Bradley, Ideal and many others at the Marvin Glass Studios in Chicago. As a result he has been granted 21 U.S. Patents. Erick then opened his own studio in the Heart of Chicago and Invented incredible electronic amusements manufactured by Bally, Williams Electronics and Stern Electronics. Erick then moved from Chicago to Florida and opened his own toy store. During the process of decorating the lobby of his private Movie Theater at his Home in Florida he purchased some life masks and was sorely disappointed that the Life Masks looked more like Death Masks. Erick decided to turn his disappointment into his next passion. 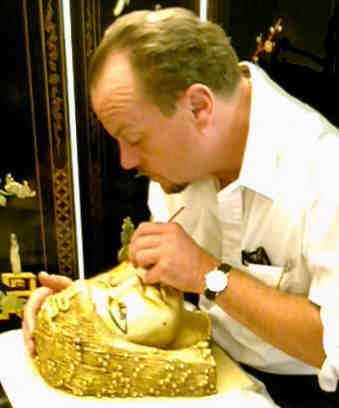 Using his talents as a sculptor Erick first restored the life masks by adding missing features (hair and ears) . Not being satisfied by merely enhancing these life masks Erick began the process of creating sculptures of the celebrity's depicting their most famous roles, he sculpts the celebrity's eyes open, adds expression, make up , hair styles and costumes. Since these sculptures are built up on an actual casting of the actors face they are truly life like you can see and feel every pore and wrinkle. I can personally tell you that it is very erie to look up and see one these characters looking at you, for an instant you'd swear that they were actually alive. Erick is now casting these works of art in limited quantities the masks that are developed as the final characters are signed and numbered.